@RJARPCGP wrote: It's now July! Isn’t it crazy? Are you guys really heating up fast? We have, you usually folllow in a couple days! Back to July and August-like temps, hooray! I also saw a deer on our property today! @RJARPCGP wrote: Back to July and August-like temps, hooray! Same here...deer are so pretty, as long as they don’t go near the boxes! Same here...it got CRAZY hot for a while. We all stayed in doors but the SFG went NUTS! You could almost watch the growth happening. All the peas and now the beans are way up over the trellises with so many that I have qt jars full in the fridge and keep bringing them to work for munchies. Today I'm going to learn how to make Dilly Beans. 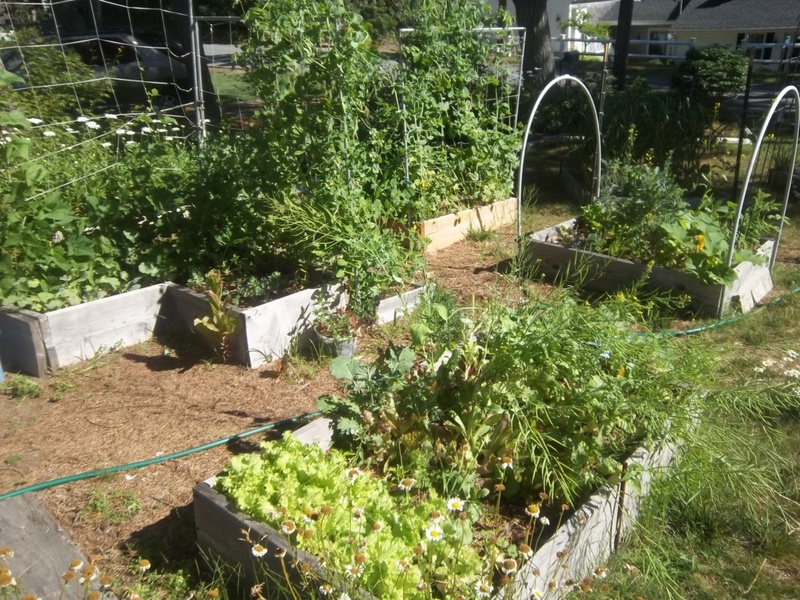 The toms and cukes are almost to the top of the trellis's, and the lettuce is getting ready to bolt. My fridge is so stuffed with lettuce that I have all my neighbors cutting like mad now to take home, and the asparagus just keeps on popping up. Still eating the scapes from the garlic that was planted beneath the fruit trees about 3 yrs ago and I'm actually getting a little sick of chard. Gotta harvest the beets - they just keep getting bigger which has never happened before! Now we're hanging out in the 70's and the grass is dormant so no mowing! Does it get any better?!? Definitely the Salad Days of Summer! Lookin’ good, CC!!! Are you canning those beans? We had some great margaritas is NOLa and they had hot green beans in them instead of pickles or celery! Delicious! I have a recipe from the Ball book I wanna try. CC, Your garden is looking so prosperous. Oh CC, I look at your garden and I want more SFG beds! All that abundance is dizzying. Once again, back to September-like temps for July 18! Record lows likely for the morning of July 19! @Scorpio Rising wrote: Lookin’ good, CC!!! 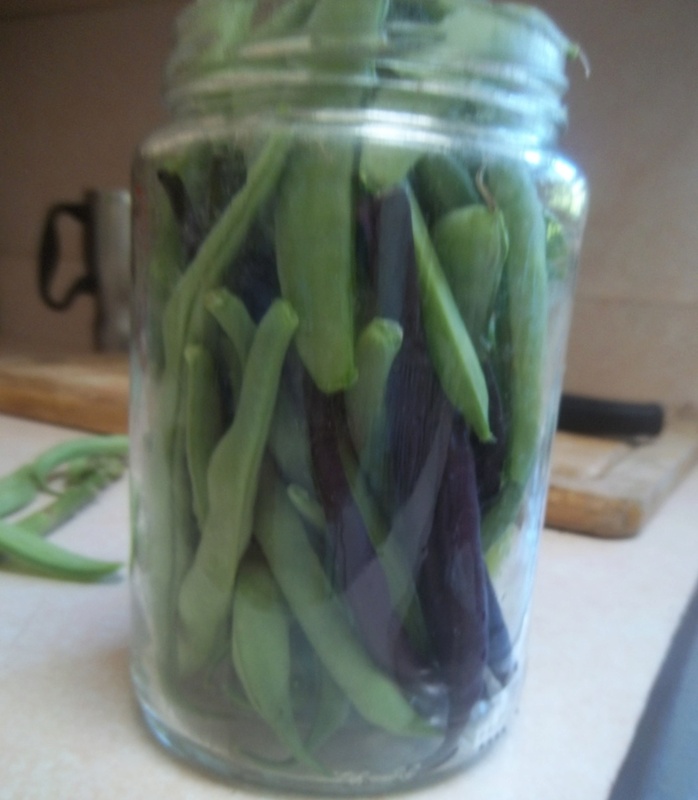 Are you canning those beans? We had some great margaritas is NOLa and they had hot green beans in them instead of pickles or celery! Delicious! I have a recipe from the Ball book I wanna try. Bloody Mary. Now it makes sense. Sometimes on this Forum, the typos or slips are entertaining. @sanderson wrote: Bloody Mary. Now it makes sense. Sometimes on this Forum, the typos or slips are entertaining. No. It was me with Margaritas on my mind! What the heck?, dropped to 45 F this morning! Both our thermometers showed 45 F and WU indicated that the official Springfield station showed 45 F, as well! I've got a spare 10 degrees if you want them. If you're making Margaritas, count me in! Imagine those are Margarita glasses. TWC is predicting a humid start to August, but otherwise fine. Looks a lot like how August, 2011 started, and that August turned out to have historical flooding in Vermont and New Hampshire! Just realized that some of you are really having some rain. Take care. @sanderson wrote: Just realized that some of you are really having some rain. Take care. Much needed rain!!! I've never in my life seen rhodies curl their leaves from lack of water like I've witnessed lately. Lawn is completely dormant, and has been for weeks, so no mowing. SR, no, I didn't can or even pickle the snap beans. I didn't have any dill and didn't want to buy any. Guess I could have used the ol' vinegar, water and a bit of sugar, but I ate them in my salads instead. They're still coming so Dilly Beans may be in my future yet. 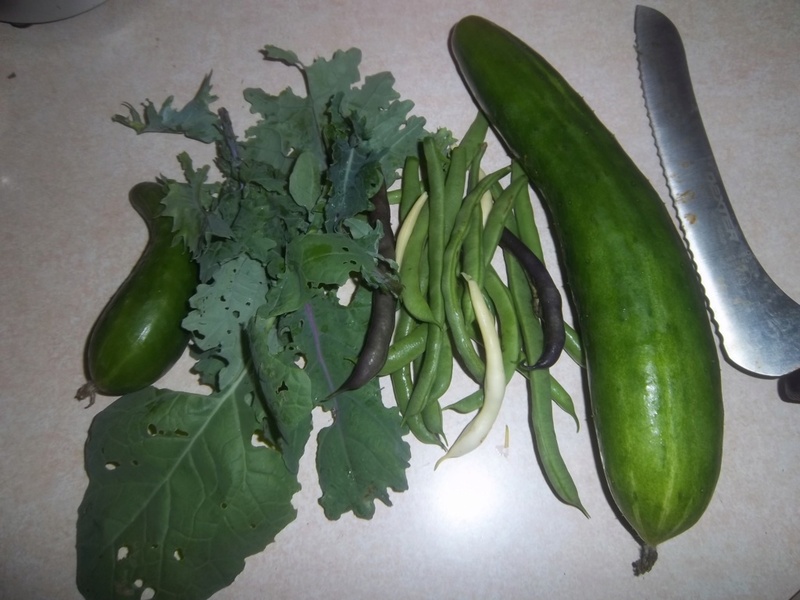 Flea beetle eaten kale for the smoothie this morning, more beans and a couple of cukes - large is Gergana, small is Persian. I think SVB should be finished laying in my area around end of July. I'd love to remove the netting from the Tromboncinos and Delicatas. I'm such a lazy gardener that I find unclipping and lifting the netting to water bothersome. Harvest all the garlic last week. All beautiful and now hanging on the basement clothes line with the fan blowing on it. 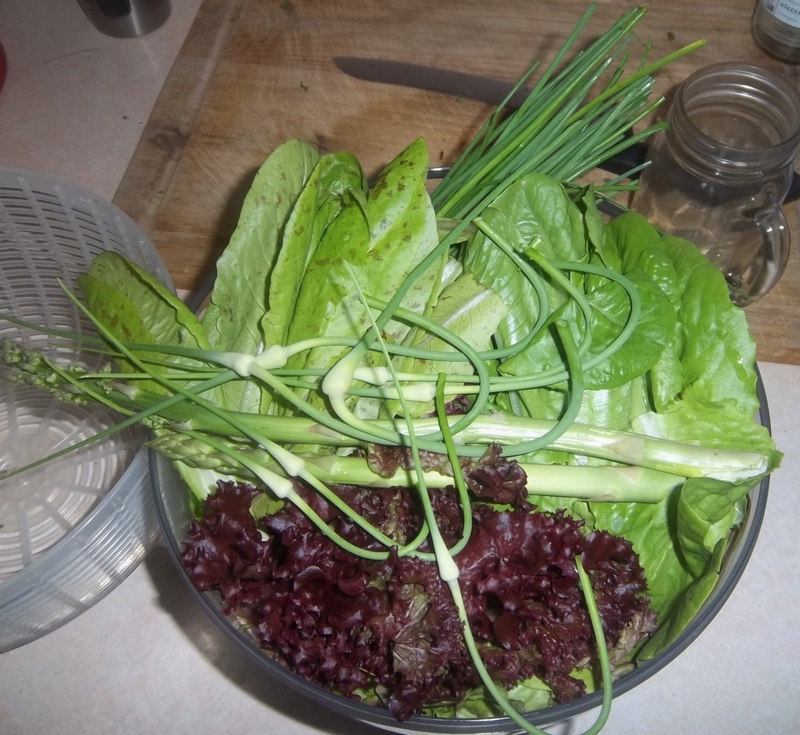 Still harvesting and eating lettuce and beets. No tomatoes yet though. No tomatoes here either, CC. But lots of greenies out there! I relocated my squash and put my patty pan (now untimely deceased) out late, which I think helped! Just started to get beans. Have had cukes, love them. Ever grow onions? @Scorpio Rising wrote: No tomatoes here either, CC. But lots of greenies out there! I relocated my squash and put my patty pan (now untimely deceased) out late, which I think helped! Yeah, I've tried ball onions a few times from seed but nada. I have 6 ball onion plants in now that a coworker gave me as starts in spring, but they don't look like they are doing much. I've grown potato onions & Green Mountain multipliers in the past but they never get big for me. If they get up to an inch around it's a miracle. Matter of fact I was looking at last years tiny ones this morning wondering if I should go ahead and plant them now because they are just going to sit there otherwise. Soooo...I buy one grocery store red onion every week. Not sure what the secret to growing onions is but I'd sure love to know. I grow Walking onions, scallions and chives with success though. Squash vine borer: Peak flight of adult moths has passed; larvae may be feeding now, leaving boring tunnels and wilted plants. There can be 2 generations per year, with the first generation larvae and pupae present now and the second generation arriving around September. The second generation can damage fruit, especially if vines have gone by.